Our dogs are our best friends, and for many of us, there are very few places we go without them. If camping is one of your favourite pastimes, why not consider bringing your dog along with you? The vast majority of campsites are very welcoming to dogs, and they are sure to have an amazing time hiking with you, exploring the area, and picking up amazing new smells. If you are preparing to trek into the wide world with your faithful companion, you are going to want to remember these five key factors before (and during) your trip. Pet insurance is a massive must when you are camping, because you can’t predict what will and will not happen on your trip. Before you depart, you should take your dog to the vet to have them checked over, as well as get any necessary vaccinations that they might need before you go. It also gives you the chance to flea treat and worm them so that they don’t get diseases from parasites. None of us like the idea of our dog getting hurt, but it can and does happen, so you need to be prepared. Pet insurance means that if your dog is bitten by a snake (or other animal), or generally injured through a fall or accident, you will be able to get emergency treatment even if you have no money on you at the time. 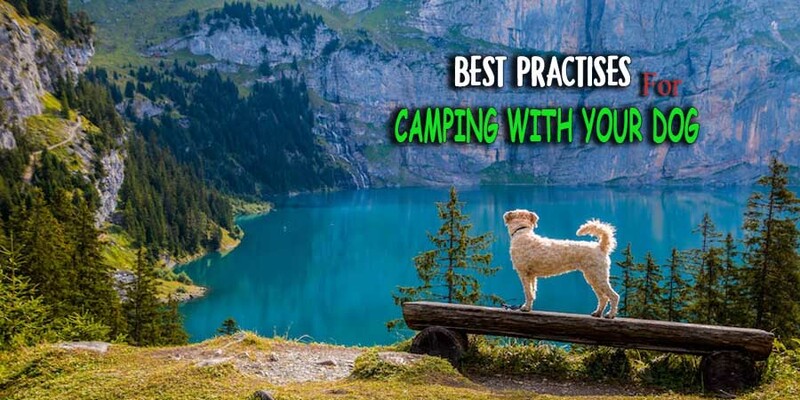 Before you, you should advise your pet insurance company that you will be going camping with your dog so that they can give you any advice, but also so that they can pre-authorise any potential treatment that would be needed in an emergency. There are very few pet insurance companies that will not cover things like this, but checking first is always a sensible choice. You should make sure that your dog has everything he needs before you head out, and that includes making a little checklist of the essentials. You will need to bring food and water bowls, preferably ones that are portable, as well as food and water for them to eat and drink over the course of the trip. You should also stock up on treats and chews to reward them for good behaviour and keep them occupied. Dog beds are also an essential, because your dog should be comfortable when they are sleeping or relaxing. Something lightweight and easy to set up is an absolute must, and it should also pack up nicely in the car on the way there and back. You also need to decide if they are sleeping inside or outside the tent, and if it is the latter, a pen needs to be set up that they are safe, secure, and comfortable in. A good selection of toys is also the best way to entertain your canine companion while on your travels. Especially in the evening, or just before bed when they might start feeling a little restless. Within their essentials kit, you should also make sure that you remember to pack any medication that they need or are taking so that they can stick to their routine as much as possible. You may also want to bring a muzzle with you, even if your dog is not aggressive, in case of emergency or to stop them from eating strange things off the ground. These basic items could be what saves your dog in an unfortunate accident. You should always have a list of the vets that are closest to your destination, as well as their number so that you can call if anything happens to them. Your dog will need a sturdy collar and lead, or a harness, while they are on the site as well as hiking. You should keep them secure and close to you at all times – both for their safety and the wildlife around them. Preferably, the collar and lead will have reflective strips, or the harness if you choose one of those instead. This will help them to be seen at dusk or if they manage to escape. While you are at the campsite, it is important to respect those around you, and the fact that they may not want a dog lurking around their site. You should keep them with you at all times and prevent them from wandering around and introducing themselves to other people. You must pick up their poo, and you should never leave them at the site unattended; for their safety and that of others. Good etiquette is the first rule of camping, no matter where you are, and saying hello to your neighbours is a great way to create friendships, as well as a community that looks out for each other. They may even like your dog coming to say hello, but you should always ask first and at least get to know the other campers a little first. Hopefully, you are now prepared to enter the world of camping with your pooch. All you really need to remember is that they should be insured, have a vet visit before they leave, and be secure and well-trained. These simple factors will allow you to have a peaceful trip with very little stress. You also need to ensure your dog is comfortable too, with good bedding and portable dishes so that they can stop for a drink while hiking. All of these little things build up into a camping trip that neither of you will forget, and dog owner has all the gear you need to get them started. What is a Camp Cot and Why Do I Need One?